Who among you are on Facebook? 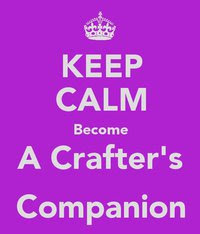 Did you know that there was a group on there called I’m a Crafter’s Companion? If you have a Facebook account then you should become a member of the group & then join in with all the chat – they’re a lively bunch on there, that’s for certain, so you’ll never be short of chatter! From craft chat to sneak peaks to inspiration to general gossiping, there’s always something going on – so what are you waiting for?…join the group & make new like-minded friends!! !